9-5 Monday through Thursday. Friday by appointment. 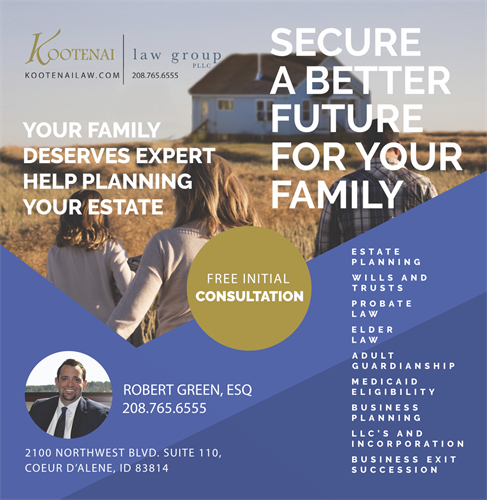 Kootenai Law Group is an estate planning and business law firm in North Idaho, serving both Idaho and Washington residents. We serve our clients in a timely and courteous manner. Our clients' needs always come first and our attorneys are up to date with the most current laws and policies, giving peace of mind that they are well taken care of and getting the best service possible. We primarily offer flat fee services so our clients know their legal fees at the very start. We offer a free, no obligation, consultation. Wills and Trusts, Business Formation, Probates, Elder Law, Special Needs Trusts, Guardianship & Conservatorship, Medicaid Eligibility Planning, Estate Planning, Powers of Attorney, 401K/IRA Trusts, and Business Exit Planning. From Highway 95, go west on Ironwood, left on Lakewood, and right on Ironwood Parkway.